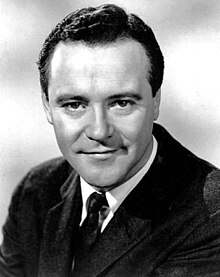 John Uhler "Jack" Lemmon III (February 8, 1925 – June 27, 2001), was an American actor and director who received many awards in his long career. He got two Academy and five Golden Globe awards. Lemmon acted in many movies, and was famous for being very good at comedy and drama. He made a famous comedic couple at many movies with actor Walter Matthau. Lemmon died of colon cancer and bladder cancer. ↑ "Jack Lemmon's WWII naval service". Combat!. Retrieved November 23, 2017. ↑ Duncan Campbell (29 June 2001). "Duncan Campbell on Jack Lemmon, a 'beautiful actor'". The Guardian. This page was last changed on 28 November 2018, at 17:34.